Have you ever ordered marketing materials from a print shop and been disappointed you’re your black looks dull or faded? 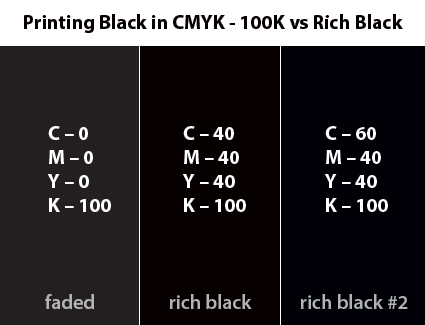 This is a common frustration and caused most likely when the designer chose 100-K black in the design program and did not include other colors from the CMYK color palette. You need something better. Something known in the printing industry as “rich black” or “true black”. It’s the way to get the black you really want. Though you shouldn’t use it all the time and here are some important tips about that perfect, rich black. Rich black is best used in large chunks. So use it when you have a large black area, such as a leaflet that uses a lot of black or has a black background. It’s also a good idea to use rich black when you’re working with a large font type. That is to say a very large font such as Futura Black at over 40 points. Finally you should use rich black when you have a lighter background and want a darker color on top to contrast with it. Sometimes a printer will get confused and mix the regular black with the background, or let the background show through. Using a rich black eliminates this problem giving you true black. Not every situation calls for true black. You should avoid using rich black in pretty much the opposite situations to when you should use it. So don’t use rich black when you are working with small patches of black, or with small type. It’s also important to avoid using rich black when you work with newspapers. Using a rich black on something like a newsprint causes it to bleed and messes with the quality of the paper. Now that you know when you should use rich black you need to know how to make it. 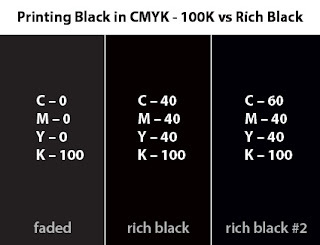 You need to use the CMYK method of color mixing to get a true black. There are actually a few ways to get a rich black. Here are two common methods for you. The first is to mix 40% cyan, 40% magenta, 40% yellow and as you’d expect 100% black (40, 40, 40, 100 – CMYK). Now some people like to leave the yellow out but it does help balance everything out. Either way you get a rich and solid black. The other way to create a true black is to mix 60% cyan, 40% magenta, 40% yellow and, again, 100% (60, 40, 40, 100 - CMYK) black. This creates a more neutral rich black. Though 240% is pretty much the limit with color mixing. So if you want to adapt this then you will need to lower the percentage on some colors if you want to add them with others. When you get used to the idea of creating and using a richer black you will become able to make your own. There are so many ways to create a rich black that a basic mixture like this might not be right for your project. These are good models to use, but don’t be afraid to make your own mix CMYK combinations and see what you can create.